In this interactive math test, use factors to find the missing number in a division problem. The immediate feedback provided by this online test can be used to identify areas of strength and weakness in the subject area of division. This test asks the student to provide the correct missing number in a division statement that makes the statement true. The seven multiple-choice questions and three drag-and-drop questions in the test provide a variety of practice and opportunity for assessment. Students should see that a missing number in a division problem can be found by determining the two factors that make up the other known number in the division problem. 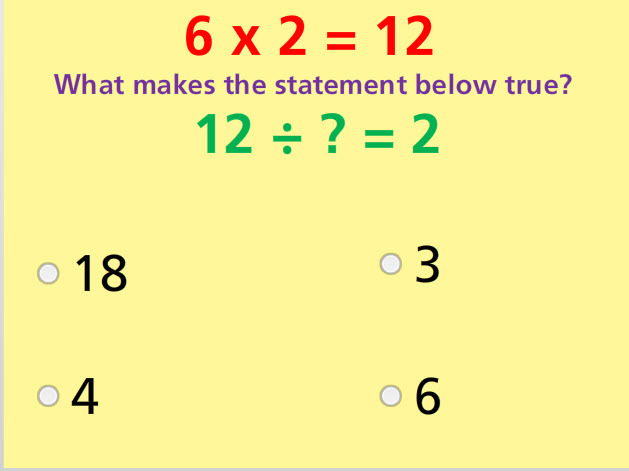 Return from this Multiplication and Division Connection Math Test to the Elementary Math Tests , 3rd Grade Math Tests webpage, or to Math Tests.